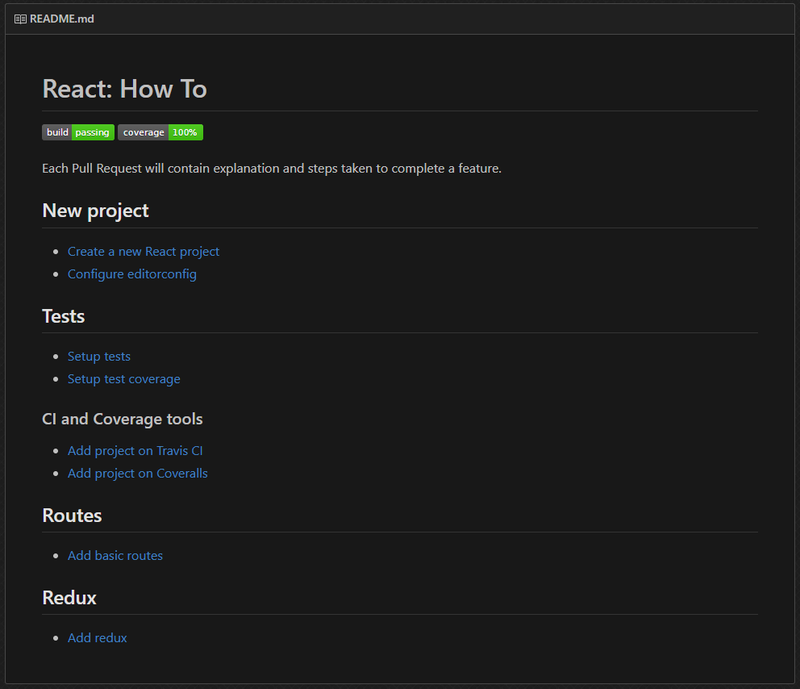 github.com/brunolm/react-how-to is a repository that shows how to do things by example. Each Pull Request on this repository is a complete guide on how to do something, for example if you want to add redux to your project you can just check this Pull Request and see some instructions and all changes required. If you want to setup tests check this Pull Request. Better than just reading some instructions you get a full example and a working project as a guide. In redux there are actions and reducers. An action executes some code and sends data to a reducer to update the application state. The application tends to get a bit messy the more actions and reducers you have. This entry was posted in General and tagged react, redux, software-architecture, typescript on April 3, 2017 by BrunoLM. react-router v4 requires you to do more stuff to add a proper route. This entry was posted in General and tagged react, react-redux, react-router, react-router-redux on March 17, 2017 by BrunoLM. I’m never satisfied with bootstraps out there, so I’m always creating some simple ones. Well this one is a bit more complex than the other ones I’ve built because of the complexity of React and Redux. This entry was posted in General and tagged babel, flux, react, redux, typescript, webpack on July 31, 2016 by BrunoLM.